Power Kite Forum - Benefits of larger tires? Author: Subject: Benefits of larger tires? Background: Recently I had a chance to kite in a larger field that got rather strong winds. Everything was setup to be a great session, except the field was rather uneven with long grass. While it was possible to get moving I needed far more power than I would have even on the water and it was quickly clear I wasn't going to have much fun. Initially, I figured it was just hopeless riding in those conditions, but now I've started to wonder if swapping out the 8" tires on my MBS Comp for the 9" ones (or something even larger) would have made a significant difference. Can anyone share how big of an effect different sized tires make when kite landboarding? tire size in general makes a huge difference. That's why I buggy instead of board given my field conditions and ease of use. 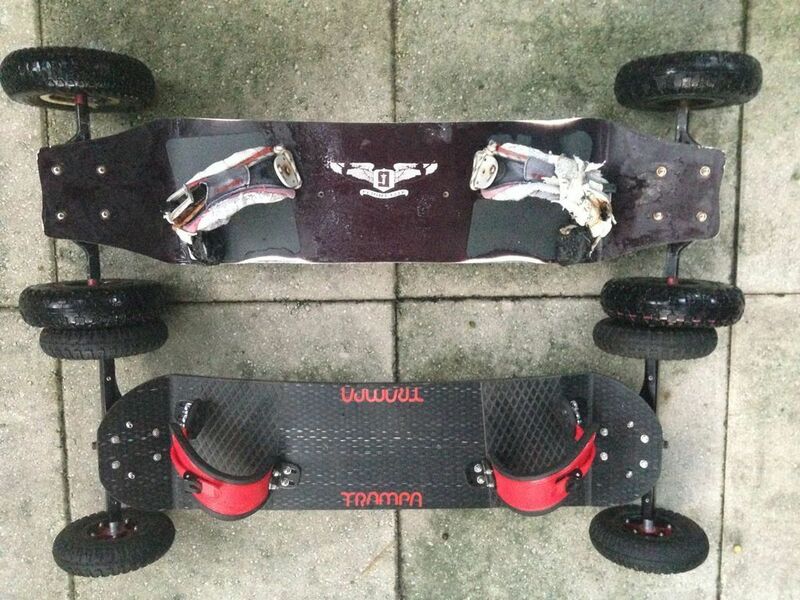 I haven't tried them, but if I ever got back into a board I would go with some sort of granny tire configuration. Those look sweet for fields. You would notice an inch larger tire on the beach or hard surface, but as for long grass, nope. Long grass is just that, long grass. Makes me think of trying to bicycle on the beach with a mountain bike through the dunes, big or little tires ain't going to go. heres a look at 8" v. 9" tire for ATB. these are 200 v. 2.80(+/-) in width. the 9's will float over stuff better, from my experience , the open field(dirt/grass/sand) tow on 8" definitely has limitations , but the 9" would do it all. this is dead on top without kite lift vector. and on a kite with the 9 i can really float across softer sand. super powder sand, heavy dunes not so great , kind of a gentle tedious ride but doable definitely not ripping it. 9" will give greater scope of terrain. super fluffy grass or soft thick grass just takes decent amount of power. any bigger gets into poor handling and excessive weight , no real gain there other than novelty for a few goes, maybe for long distance cruise but limited. So, it sounds like bigger wheels wouldn't magically make the tall grass ridable, which is about what I expected. Still though, seeing the pictures PHREERIDER posted and what others have said, it seems like there's definitely some value. Now I just need to figure out which ones to go with. The MBS T2 are the most obvious choice, but they seem awfully expensive ($70 for just the tires). Anyone have any suggestions on good 9" tires? hub specific as well, kinda pricey set for sure. they do last longer , its considerable more tire . probably better to buy a Flexboard from bigkid...arent they all 9" setups? the HAIZE comes with the 9" , indeed you have to have specific hubs for 9". in fact the 9" runners that come on FLx Haize are super floaty, one of the tires in the comparo pic is a Haize runner(white rim). they are much softer than the stryker 9". strykers are hard ,very weighty, tough tire. Cost of new tires and tubes was about $40 total. My kite buddy put go-cart tires on his Core 94 and it also rides great on the beach. The go-cart tires will take some loose sand but not dunes. Only problem I found with 10inch tyres are your feet or toes rubbing on the tyre rim, especially if the trucks are closer to the board like on my Core95. If you're going bigger tyres, make sure you have room for your feet. Perhaps an extendd truck system that places the wheels further out of the board itself? The extra inch or two I've found useful on grass. 7" to 9" completely changed the rideability of one of the local fields (friend's board has 7"). Still going to need more power for taller grass, but the extra couple inches can mean the truck is lawn mowing the grass as much and just hitting the tips more, which changed things for me, that said, your skill level I'm positive is above mine.